Even though we are not feeling the numbing cold of the North, this hearty slow cooker chicken dish hits all of the comfort notes associated with cold weather. So for a short while I will indulge my fantasies of snow and enjoy this flavor-filled dish. We have been in Florida for two weeks. So far the weather has been lovely. I have enjoyed the local New Smyrna Beach farmers’ market and being able to walk to town for a quick bite at the local restaurants. 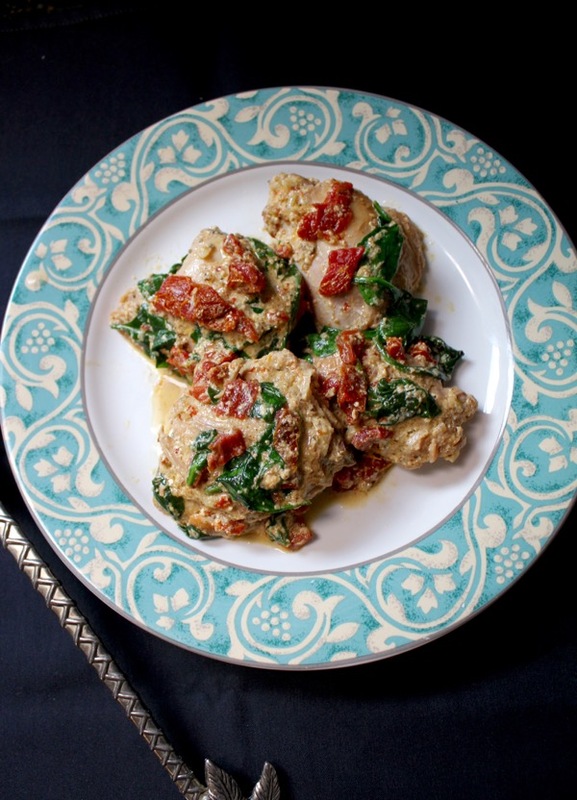 When I saw this recipe on-line for this Tuscan chicken dish, it brought back memories of our trip to Italy. Part of the beauty of Tuscan recipes is the simplicity of the ingredient. Simple chicken thighs are paired with a creamy Parmesan sauce and enhanced with lots of garlic, Italian herbs, sun-dried tomatoes and baby spinach. 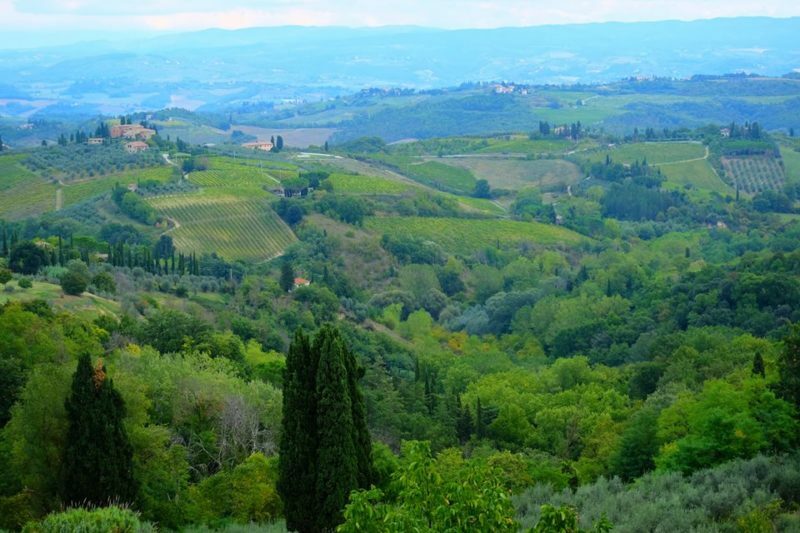 The rolling hills of Tuscany produce wines, garden fresh vegetables, cheeses and pasture raised poultry. 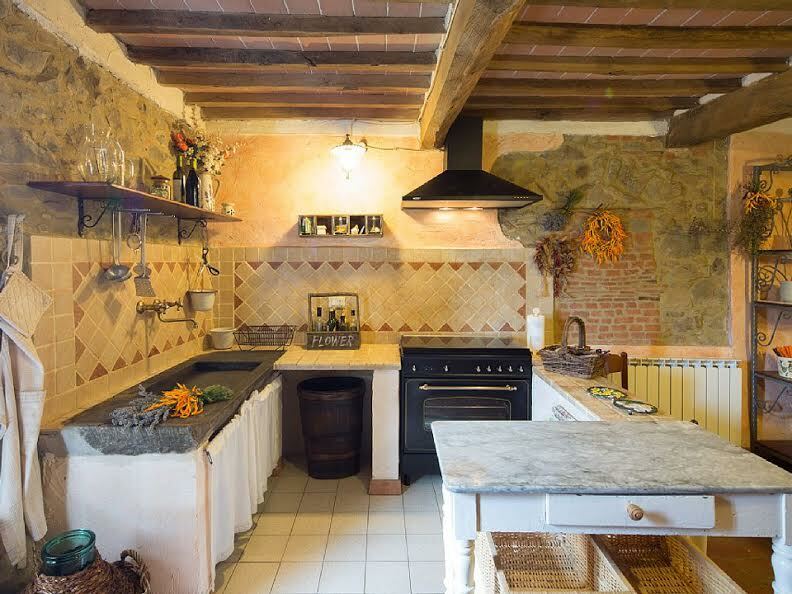 We were fortunate to find a lovely villa in the Tuscan countryside. I have fond memories of cooking in this kitchen. The crock-pot in my Florida rental house is old and smaller than what I have at home. But it was just big enough for four chicken thighs to bubble away in the creamy sauce. On a January day, I was warmed by both this hearty chicken dish and by memories of the Tuscan countryside. Recipe came from eatwell 101. Heat oil or butter in medium sauce pan over medium heat. Add garlic and saute for about a minute, until fragrant. Add the cream and chicken broth. Bring to a gentle simmer, then set heat to low and simmer for about 10 minutes. The sauce should thicken enough to coat the back of a spoon. Meanwhile, place the chicken at the bottom of your slow cooker. Season lightly with Italian seasoning, crushed red chili pepper flakes, sea salt, and black pepper. Top with sun-dried tomatoes. When the cream sauce is ready, lower the heat and whisk in the Parmesan cheese, little by little until smooth. Adjust seasoning as needed. Pour the cream sauce evenly over the chicken thighs in the slow cooker. Try to get as much sauce as possible on top of the chicken and less on the bottom. Cook for 3-4 hours on HIGH or 6-8 hours on LOW. 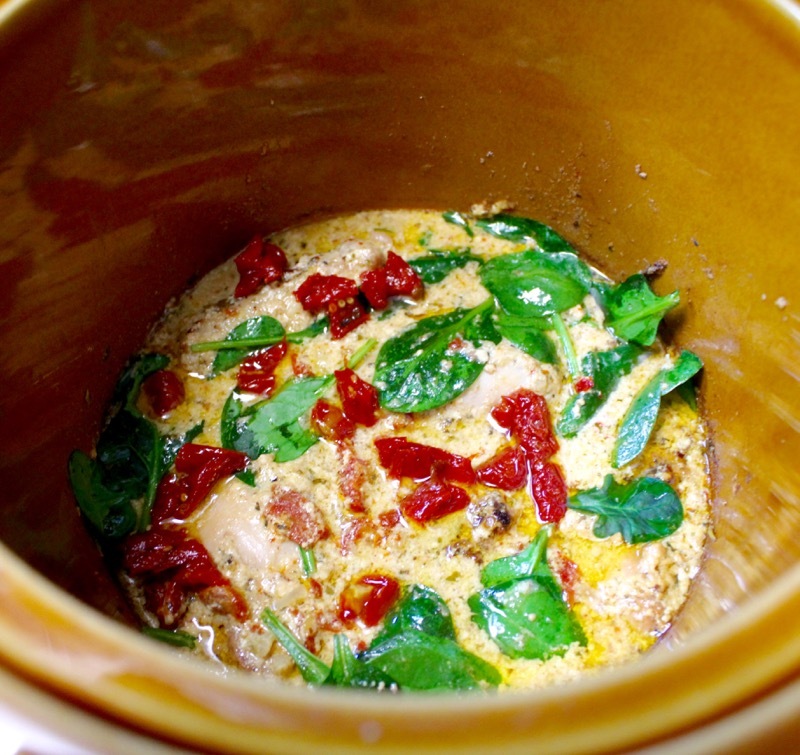 When cooking time is over, remove the chicken from the slow cooker and set aside. Turn the slow cooker on HIGH, if it sin’t already. Add the chopped spinach and stir for a few minutes, until the spinach wilts. 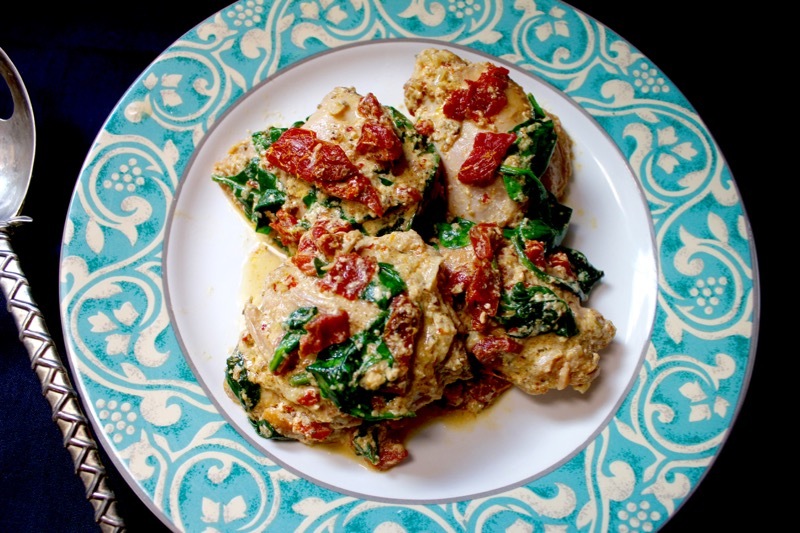 Return the chicken to the slow cooker, and spoon the liquid, spinach and sun-dried tomatoes on top, or just pour them over the chicken when serving. Posted on January 13, 2019 at 5:49 pm. One of the harbingers of Spring for me is my get together with blogging buddy Penny of Enjoying the Simple Things. While we were shopping my crock pot was ready and waiting to offer these herb flecked potato wedges to accompany David’s grilled meat and a quickly tossed salad. Our first stop on our antiquing outing is always The Screen Door. It is one of our favorite antique malls for unique finds. This wire wall hanging was tempting, but we passed on it. We saw this Chateauneuf du-pape bucket at another place. I am now thinking that I should have bought this. I can just see it filled with greenery or fresh or dried flowers. Shopping works up at appetite and we always have lunch on the patio of Fig, our favorite French bistro. I ordered the very un-French Pappardelle Bolognese. It was creamy and studded with delicious sausage. Penny ordered the salmon with potatoes and fresh peas drizzled with a mustard cream sauce. Fig does the best job with salmon. It is always flaky and cooked to perfection. It was good to come home to these tender and tasty potato wedges. This recipe is good for a crowd too. I love recipes that cook themselves so I can concentrate on other parts of a meal. Wash and cut the potatoes into wedges. Add to the slow cooker. In a small bowl mix together the olive oil, garlic, salt, pepper, thyme and oregano. Pour this over the potatoes and stir. Sprinkle over the parmesan cheese. Cover and cook on HIGH for 3 hours without opening the lid during the cooking time. Sprinkle with additional cheese for serving if desired. Posted on April 20, 2017 at 8:06 am. 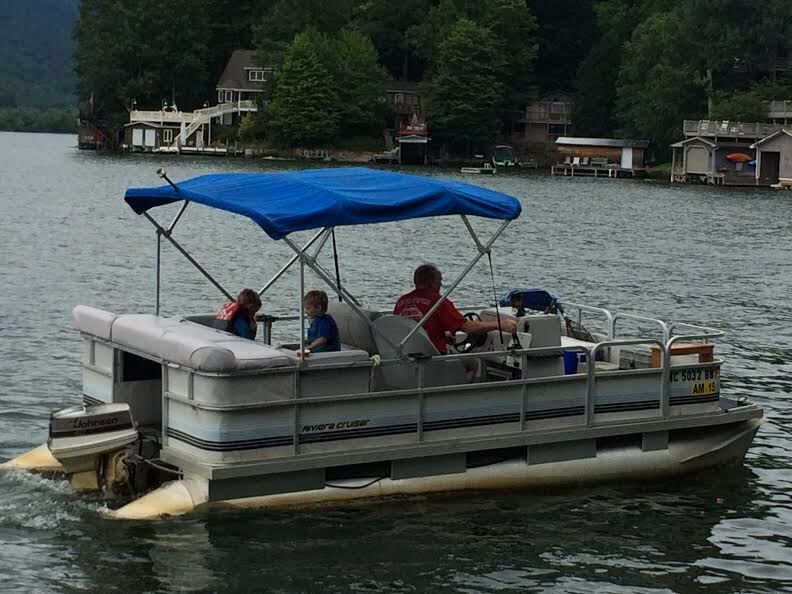 Busy days on the lake call for easy meal preparations. Flank steak fajitas cooked in the crock pot could not be easier. But my hands off plan was somewhat thwarted when I realized I had forgotten to buy flour tortillas. I googled homemade tortillas and found a recipe that I was able to turn into the very best tortillas I have ever had. It was not complicated and made me happy that I had forgotten to buy them. Also, the bonus is having additive free tortillas. I did substitute half whole wheat and half all-purpose flour though. It called for only whole wheat flour. There are so many things going on around the lake. Gampy has enjoyed taking the grandkids fishing this summer. So far they have not caught anything. Maybe it is because getting them up early when the fish are biting is not easy. Add all the condiments you would like to this simple recipe. It is sure to be winner with the whole family. The recipe came from a new cookbook that I checked out of the library. It is 100 Days of Real Food by Lisa Leake. She also has a blog of the same name where she stresses a diet based on whole foods rather than processed foods. 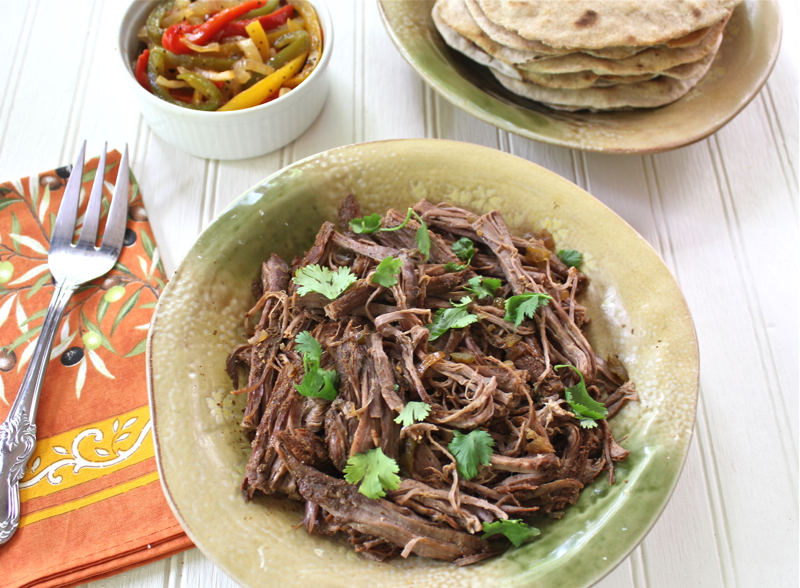 The only change I made to the crock pot flank steak fajita recipe was holding out some of the bell peppers to cook separately because the long cooking in the crock pot made them very soft and colorless. The flavor of the meat is mild, so if you want more kick add the seeds of the jalapeno and a few pepper flakes. In a small bowl, combine the chili powder, cumin, coriander, salt, and pepper. Rub the spice mixture over all sides of the flank steak, place it in the bottom of the slow cooker, and add the soy sauce. Top the flank steak with the jalapeno, garlic, 3 of the peppers, and onion. There’s no need to add any water or other liquid. Cook on high for 5 to 6 hours or on low for 8 to 9 hours, or until steak can easily be shredded with two forks. Near the end of cooking time, heat a small amount of oil in a medium saute pan and cook the 2 remaining sliced peppers until softened, but still retaining their bright color. Thoroughly drain the meat and peppers, saving the juiced. 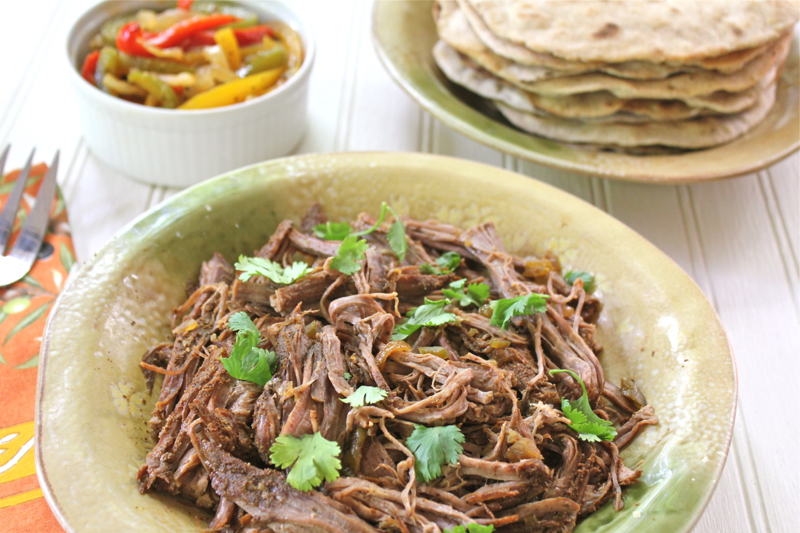 Shred the meat, and serve with the fajita fixings of your choice. Recommended accompaniments: Whole wheat flour Tortillas, freshly grated Monterey Jack cheese, sliced avocado, fresh cilantro, lime wedges, fresh chopped lettuce, sour cream and/or diced jalapenos. Posted on July 13, 2015 at 3:27 pm. Because it has been so cold in Florida and because I have been reading so many blogs from the more frigid regions of our country, I just had to pull out the slow cooker to cook something long and slow all day; something that would perfume the house and build an anticipation for the satisfying meal to come. 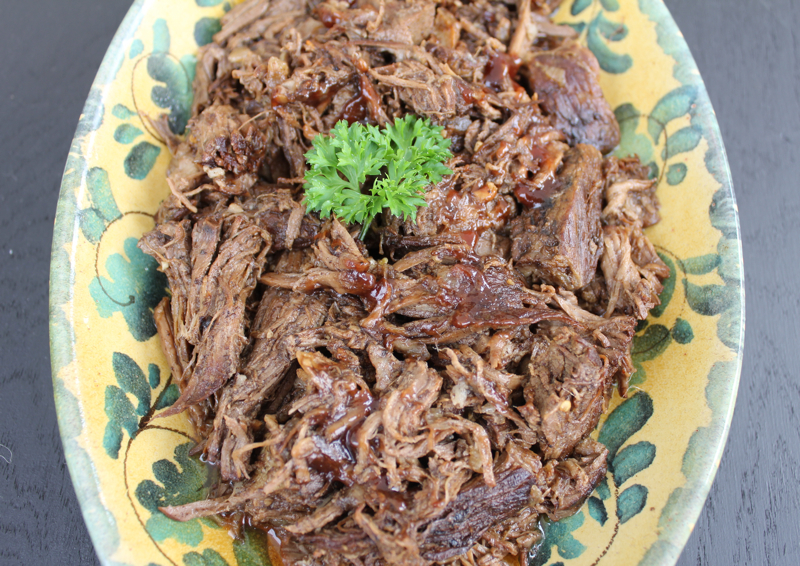 I had a chuck roast freshly defrosted from the freezer and several different recipes for crock pot beef to choose from. I ended up combining several. What I was looking for was intense flavor to offset the richness of the beef. The balsamic vinegar went a long way in achieving that goal. 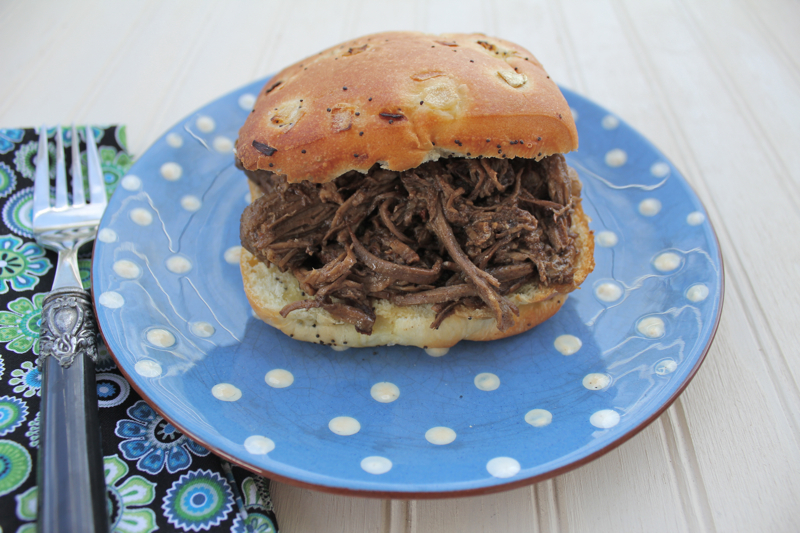 There are some recipes for slow cooker beef that include dried onion soup mix and cream of “whatever” soup. I try to stay away from those recipes. The additive ladened products just seem to intensify over long cooking, in my humble opinion. And not in a good way. The ingredients I used were simple; beef broth, balsamic vinegar, soy sauce, Worcestershire sauce, brown sugar and a bit of ketchup. The resulting beef was succulent and delicious. The sauce was especially good. It was so good in fact that for lunch the next day I made a “Dip Sandwich”. The tender beef and juices made for a marvelous sandwich. The sandwiches would be great for a super bowl party. Place 1 tablespoon of oil in a heavy bottomed skillet. When hot, add chuck roast and cook until browned on one side. Turn, add onions and garlic to pan along with the meat. Cook on second side until it is browned and onions are softened. Salt and pepper to taste. Place browned meat. onions and garlic in a slow cooker. Mix together the remainder of the ingredients and pour over beef. 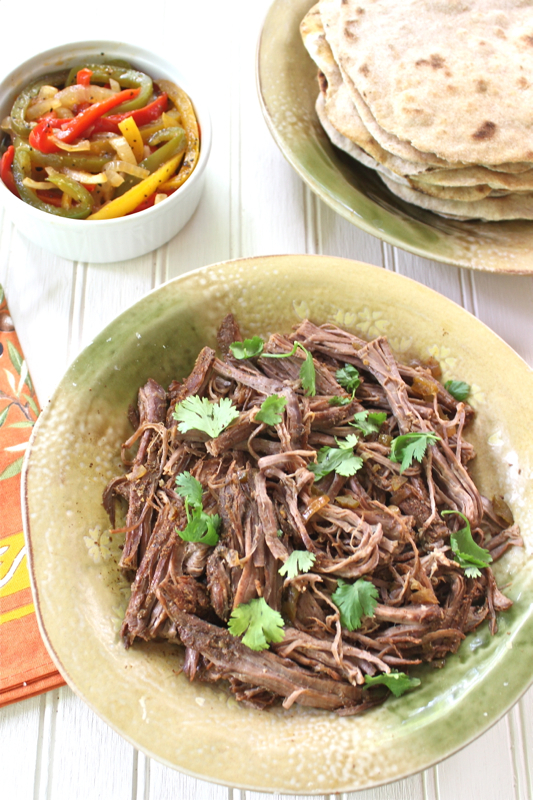 Cook the beef, covered in the slow cooker on a low setting for 7 to 8 hours. Remove beef to a plate. 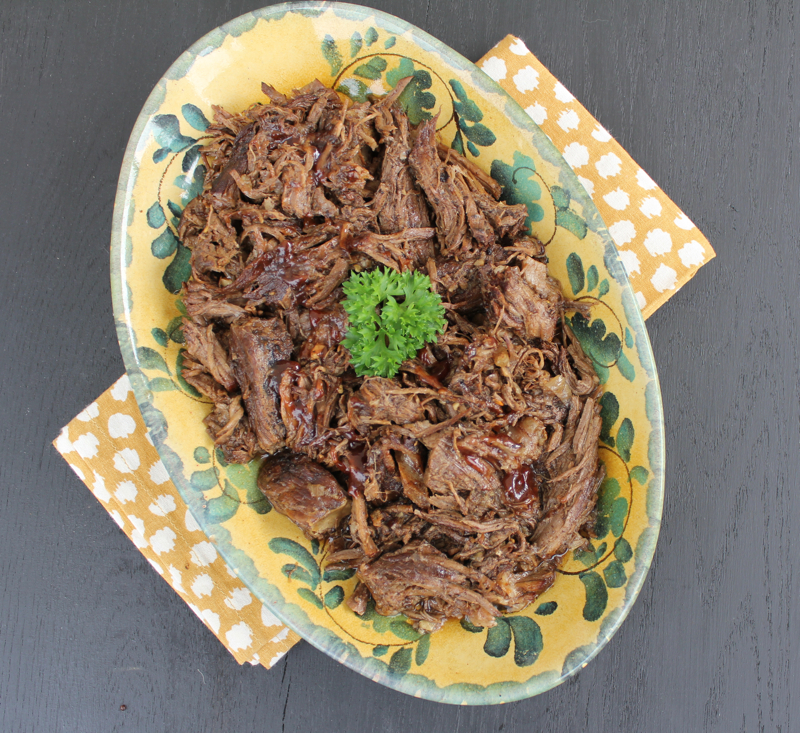 Shred it with two forks and return to slow cooker to combine with the juices. Serve. Posted on January 13, 2014 at 12:17 pm. My husband and I actually went to high school together. He graduated a year ahead of me. This summer his class held their 50th class reunion. Can that really be possible? So the weekend before last we traveled back to Michigan to attend the event. It was great to see everyone. In my opinion most people looked the same because, in my mind’s eye, I can still picture the teenagers that dwell within. I hope everyone else has as vivid an imagination as I have. A trip home also includes time spent with my Brother and his family. My Sister-In-Law, Barb, claims not to be a good cook, but I have never had a bad meal in her house. 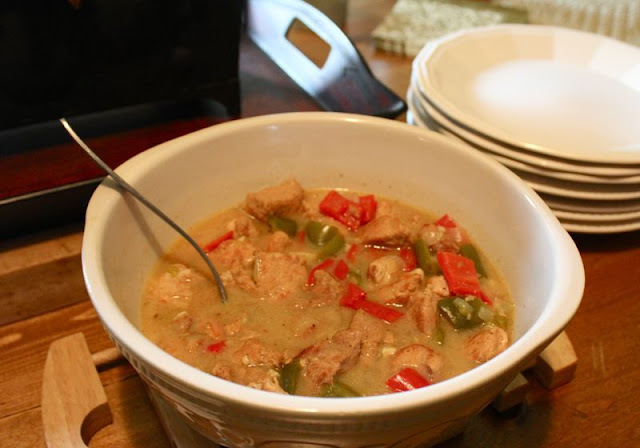 In spite of the fact that she read the recipe wrong for this Caribbean Pork Stew with Peppers, it tasted yummy and makes a great Crock Pot meal. My niece Morgan loves to cook and her contribution to the meal was flavorful Hawaiian Chicken Skewers. 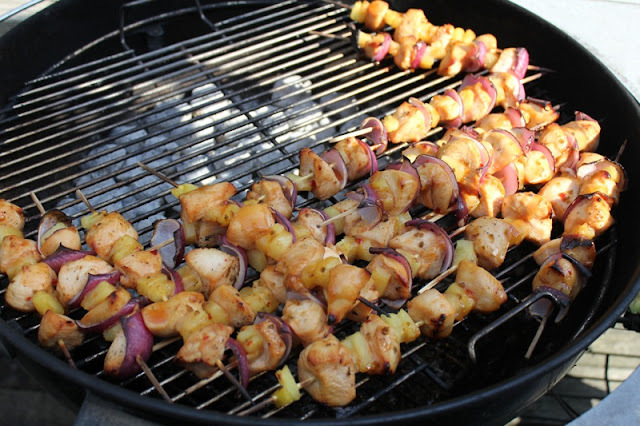 The skewers were threaded with cubed chicken breast, pineapple chunks and red onions. My Brother Bill is a grill master. He refuses to use a gas grill and everything is done over charcoal and sometimes flavored with wood chips. He has a serious grilling platform. He has 6 Weber grills and sometimes they are all in use at the same time. Bill got all of his grills for free. His charcoal grills were all discards. People throw away grills when the bases rust out. The grills themselves are usually just fine. 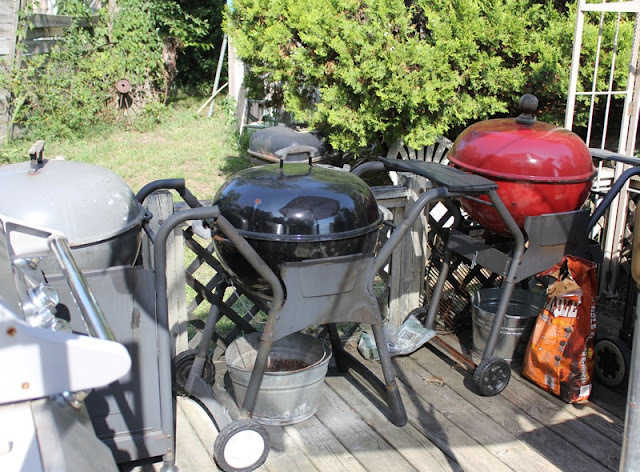 He mounted the grills on old gas grill bases that were also discards. In addition to the wonderful meals we were served, I came home with a bounty of potatoes and tomatoes from Bill’s garden. Here are Barb’s and Morgan’s recipes. I am lucky to have such a talented and creative family. 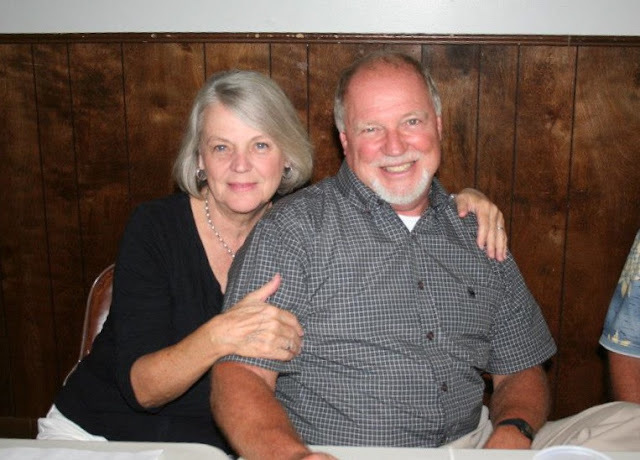 By the way Barb just started a blog called The ReShore House. She and Bill live in an 1860 house on 2 1/2 city lots next door to the house where Bill and I grew up. Mrs. ReShore still appears on occasion to those who believe in ghosts. Visit Barb’s new venture that chronicles her antique business and life in an old house. Welcome her to our blogging community. Thanks. In a large resealable food storage platsic bag, place flour, salt and pepper. Add pork; sela bag and shake to coat. In 12-inch skillet, heat oil over medium-high heat. Brown pork cubes in oil on all sides, working in batches if necessary. Spray 31/2 to 4-quart slow cooker with cooking spray. With slotted spoon, remove pork from skillet to slow cooker. Stir in all remaning ingredients. Cover; cook on Low heat setting 6 to 8 hours. Serve over cooked rice. Sprinkle cubed chicken with garlic powder, salt and pepper. Place in resealable plastic bag. Add marinade and marinate overnight or 8 hours or so. Remove chicken from bag. 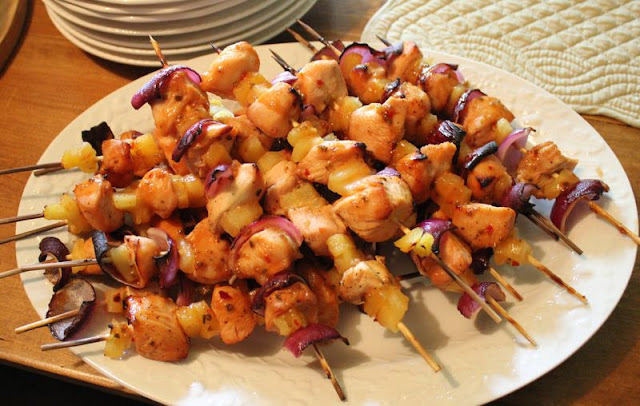 Place chicken cubes alternately with red onion squares and pineapple chunks on skewers that have been soaked in water for 1 hour. Grill over indirect heat on a charcoal grill until chicken is cooked through. Posted on September 6, 2012 at 6:44 pm.